The Cricketers, in the Brighton Lanes, dates back as far as 1547 making it the oldest pub in Brighton. A warm welcome awaits inside with Victorian touches aplenty…think plush red velvet seating, thick carpets and plenty of framed prints lining the walls and the ceiling. Upstairs you will find The Greene Room, a private function room and bar, ideal for your next big event with space for up to 70 people and a built-in sound system. For history enthusiasts, the pub has an interesting background. The original Landlord, Derrick Carver, was burnt as a martyr for his religious beliefs and one of its most famous “guests” in the past was Jack the Ripper – in The Greene Room upstairs, you can spend some time following the story of his origins and how he planned his murders from this very spot. Perhaps most famously, this is also the pub immortalised by Graham Greene in his classic novel ‘Brighton Rock’. 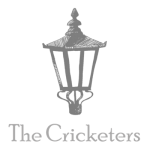 The Cricketers is part of the Golden Lion Group; a family run pub company established in Brighton & Hove over 30 years ago. We host regular live music nights in the ‘Courtyard Bar’ every Tuesday and Friday Night. Check our Facebook feed for regular updates on upcoming performances. House bands include live Soul & Funk from JOEL WHITE every other Tuesday and Motown classics & modern-day music from EMPIRE every other Friday from 10pm.